Just right weight for an all-season blanket in the southeast. Weave is tight (which I like best) and size is generous. 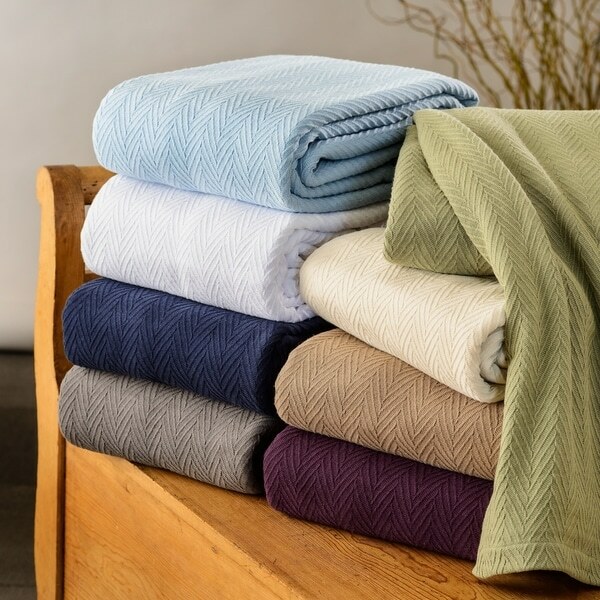 Wrap up in the unparalleled comfort and warmth of this charming 100-percent cotton blanket by Superior. Well-crafted for durability and style, this blanket incorporates a crisp chevron pattern that lends unique texture and charm, and is perfect for use all year-round. An excellent complement to any living room or bedroom decor, this excellent blanket is machine washable for convenient care and longevity. FINALLY... A PERFECT Cotton Blanket! I am almost in shock! I have looked and looked and FINALLY found a "PERFECT" cotton blanket that does NOT leave lint balls all over it and your sheets, and has a tight enough weave that it does NOT pull when walked on by my 3 dogs! I washed it prior to using and there was just a little lint left in the dryer trap. I ordered it in the Ivory and have COME BACK TO ORDER both the Sage and the Camel. I sleep "hot" so a cotton blanket is the only kind I can sleep under! About 10 yrs. ago I found a cotton blanket that was not covered in lint balls when washed and had a weave tight enough that it did not snag. Unfortunately I only purchased one of them, and later could not find any like it. Since then I have been looking for and trying other cotton blankets, however, every one I have tried (at least 15) have left lint balls and/or pulled until I had to get rid of them! I am SOOOOO happy to have found this blanket! I will be donating all those horrible cotton blankets with pulls and lint balls, and will only be using this blanket! Thank you Overstock for offering such a fine quality cotton blanket! I like the 100 percent Cotton Metro Blanket. It very warm and comfy and the material is thick. It washes good too. I will be ordering it again in the future for a different color. Purchased this 100% Cotton Metro Blanket in King Size for my Queen Size bed. The materials and craftsmanship is top of the line for a great price. I would rate this Blanket a Five Star except for the fact that the Metro Blanket is about one (1) foot to eighteen (18) inches too short (top to bottom) . . . when the Metro Blanket is placed on the mattress at pillow height, the writer was unable to tuck the Metro Blanket under the bottom of the mattress at the foot of the bed to ensure the Blanket stayed in-place. These are amazing cotton blankets. They have a nice weight but when your sleeping they are light and give you just the tight amount of warmth. I live in Florida and this is perfect for all year round. Bought two of them and will buy three more. My cousin bought some at a major retail store the were 3x more expensive. These are comparable to hers. Just love this blanket. I bought this blanket in king size and in plum color. It's generous in size even after I washed it in warm water (the directions said to wash in cold water). I'm assuming that it shrank a bit, but there's still plenty of it (it generously hangs on the sides and the foot of the bed.) The blanket is a nice weight for all seasons and the chevron weave is a subtle nice touch for those who pair it with a patterned duvet cover/quilt/comforter. With the plum color, make sure that you wash it alone for the first few times. It's a saturated color and even though it doesn't lose its depth of color, the dark purple will bleed onto other 'reds'. It's very high quality even though it doesn't cost as much as other king size blankets. Worth every penny. Finally found the one I was looking for! I love this blanket...I had been searching for a long time for an all cotton medium weight blanket like I use to snuggle under at my Mema's house when I was a kid. Took longer than I thought and a couple of errors that had to go back but this is the one. It's a nice tight weave and the perfect weight for a snuggle and a great layer blanket. It kept its shape very well after washing and it's not scratchy or rough. Two things to keep in mind, this is not a fluffy micro whatever fiber that's actually made mostly of polyester and is great on the couch but will sweat you out of a bed. This is real cotton with that just right right weave and weight to drape down around you instead of floating on top of you so you have to tuck it under you for it to stay put. Also I do extensive research on reviews and descriptions so pay attention to your measurements. If you have a full/queen size bed and you want this to go to the floor, its not going to. And to save you some time neither is anyone of the other brands out there. If you want it to the floor (like I always have) order a king or plan on it being very short on one side. I actually found that I very quickly got used to and even liked layering this under a quilt which surprised me but I really like the blanket that m much. I'm returning a fiesta brand blanket (great if you want a very loose weave) and ordering another one of these (wish they had red like the one I'm sending back) the best thing to remember when you are looking for something very specific is to order more than one brand and be prepared to maybe be disappointed and returning one or two but the search was worth it because this is what I was looking for. Good value. Accurate color and nice all-season weight for blanket used in warm room of with down comforter. Excellent quality blanket purchased for guest room twin beds. I washed my blanket after receiving it and no shrinkage at all! Good quality and the blanket is a lot nicer than the picture showed! It fit perfect on our king size bed! Absolutely love this blanket. Dimensions are perfect (even for my king size bed). It's very durable and resists fabric pulls (even up against the claws of my 3 cats and 1 dog that share the bed w/me and my husband. I purchased the purple blanket, which has been through multiple washes over a 4 month span and it has not faded. I've purchased 2 other blankets (not this one) in the past and have been very disappointed and gave them away. I'm now purchasing 2 more of these blankets. I highly recommend them. I love all-cotton blankets, but finding a good one has become harder. I was thrilled to find this one, and, after several bad experiences with expensive cotton blankets shrinking in the dryer(on low, too!) I ordered this blanket in a King. In order to have the maximum length for use, I turned it 90 degrees before putting it on my bed. Wow! It's been wonderful! The length is perfect now! My big puppy has been clawing at it with her needle-like claws but hasn't managed to hook one in it, which is a huge bonus! Any blanket that can hold up to puppy claws is #1 in my book, and I am going to purchase another one! This is one of the few Overstock items I cannot recommend. It is very heavy and not a bit luxurious. Furthermore, it is not very attractive. I really regret not returning this during the time given. Anytime you receive something that does not suit you, use the return label in your package to send this back to Overstock. They stand by their products. I purchased the dark grey all cotton blanket and washed it immediately as it had a funny smell from being wrapped in plastic. It washed beautifully and looks fantastic. I put it in my duvet and it offers a nice weighted feel. Great for Fall weather and since I sleep HOT I'll probably use it all winter. Excellent quality. The blanket is heavier than I expected. I'll need a different blanket for the Summer. I have tried several cotton blankets through the years and this by far is the best one I have ever owned. It fits my king sized bed perfectly with not too much overhang on the sides but more than enough to tuck in securely at the bottom of the bed. I washed it upon receipt in warm water instead of cold and it didn't shrink not one little bit. That's what has happened with all my cotton blankets through the years. If you are looking for a medium weight, all cotton blanket this is your best bet. I highly recommend this blanket. This has been perfect to add to my bedding during cold months. Not too thick or thin. I have had it for 2 years. It has not snagged yet. I have had this blanket for over a year now. Nothing special. It has shrunk up quite a bit from it's original size. It is okay. It is on the stiff and scratchy side. The stitching has held up nicely. It is just a ho hum basic. Nice blanket. Appears oversized for a queen bed which worked out nicely. Great cotton blanket! Nice weight! Washes nicely and is light, but not to light.. This blanket is very lightweight and thin. But it’s what I wanted due to getting hot during the night. It is cotton and has a nice pattern. I have enjoyed my blanket so far. Have ordered two of these blankets. Both great! Ordering was easy, delivery very fast. The blankets themselves are tighly woven so you aren't constantly catching on them and putting pulls in them. Keeps you warm when you need to be warm and cool enough when the weather is warmer. They launder beautifully. "How does it hold up with cats?" This does capture small amounts of pet hair is it not Pet-friendly or Hypoallergenic. This blanket has snagged from my dogs.. I can’t imagibe what a cat would do to it. Wouldn’t be pretty. "I like the color of Taupe they show in the photo of the the blankets folded. Yet in the photo of it folded out it looks really dark almost a "mushroom" color brown. I wanted to know just how dark the Taupe brown was." I would say that "mushroom" brown is more accurate. It's definitely darker than "taupe." Wow! We each have our own ideas of how dark or light a color is. (I think of mushroom as lighter than taupe.) But, since you asked the question, I'm pretty sure this blanket will be darker than you want. Different color tone, of course, but it's almost as dark as my teak furniture. I bought a sage green blanket. It was true to the color as pictured in the advertising photo (not the color swatches). I suggest that you zoom into the color of the blanket that you want to buy...that will be the color that you get. "Is the plum color closer to the purple in the stacked photo and the one draped over a chair or is it the redder shade of purple in the stand alone photo?" I would say the plum favors toward the red side, versus purple favoring toward the blue side. The plum is true color as it does favor toward reds instead of blues. When viewing the picture where the plum blanket is laying over the gray chair/couch arm, I would say that it is the best color as the true color. It is a very dark purple. "What is the return policy if this doesn't meet our expectations or fit our bed?" "Is the Charcoal color a true grey? because it looks more brown in the solo picture, but grey in the picture of all of the blankets"
Sorry, I ordered the blue. It is true to the color in the picture. Not sure -- I purchased the navy blue blanket. It's beautiful, perfect weight for us, and washes nicely. It's been washed a number of times and the blue still looks like new. "Is the Aqua color really aqua ? Not blue or green?" I ordered two twin size in green. The picture is true to color on that. Love the blankets!! Also not sure. I also purchased the "blue" which I describe as a good old fashioned "powder" blue. It is of good quality and washes well. "How far does king hang over the sidesign. Our mattress depth is 15 in"
On my king mattress the blanket only hang about six inches on each side. My wife complains that it is not wide enough, but works fine for me, especially if you don't sleep on the edge of the bed.